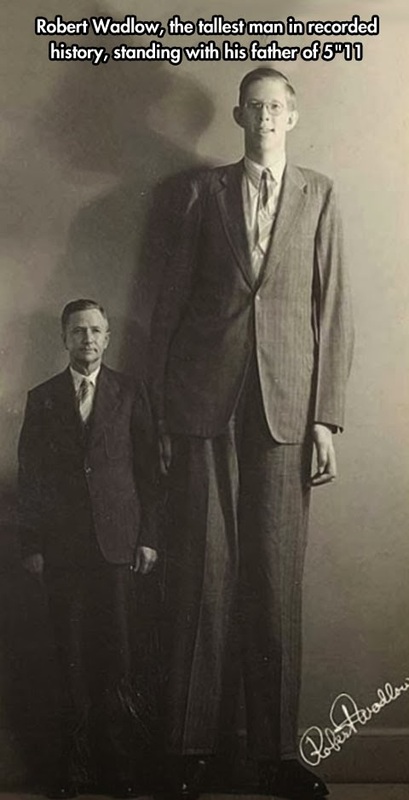 Robert Wadlow is the tallest person in recorded history; basically, this means he is the tallest person that we know of that was verified to be so. This guy reached an amazing 8 feet 11.1 inches which is almost unbelievably tall. He was born on February 22, 1918 to Addie Johnson and Harold Wadlow in Alton, Illinois. Records show that he was 1 ft. tall at birth which is normal but by 6 months, he was already 2 ft. tall which is not normal and by the time he was 1-year-old, he was 3ft. tall and so did his growth continue till his death on July 15, 1940. Medical doctors say his great height and continued growth even as an adult was due to hypertrophy of his pituitary gland which results in an abnormally high level of human growth hormone. There was no sign that he stopped growing which means had he not died at the age of 22, he would have in all likelihood grown even taller which is an amazing thing indeed. Robert Wadlow was a celebrity in his day especially after his United States tour with the Ringling Brothers Circus in 1936 – who would not want to see such a living wonder in person if he dropped by their area? Definitely not moi. He died from complications arising from infection of his foot in 1940 despite blood transfusion and emergency surgery. The “Alton Giant” as he is sometimes called because of his Alton, Illinois hometown retains the Guinness World Record for the tallest man in recorded history. For how much longer will the “Gentle Giant” (another one of his nicknames) hold this record? Time will tell. Additional information about Robert Wadlow can be sourced by clicking here and here.